With the massive universe of vegetables now available in most communities, it's time to venture outside of your food galaxy and do some interstellar travel. Set aside the staid vegetables of your mother's cupboards and live a little! Variety, as they say, is the spice of life. Enter the fleshy vegetable known as bạc hà in southern Vietnam, also known as "dọc mùng"in northern Vietnam, "taro stem," "to-ran" (Korean), "giant elephant ear," "Colocasia gigantea," "Indian Taro," and "hasu-imo" in Japan. (Note: In northern Vietnam, bạc hà refers to a minty herb). Read on for selection, storage, and recipe ideas! 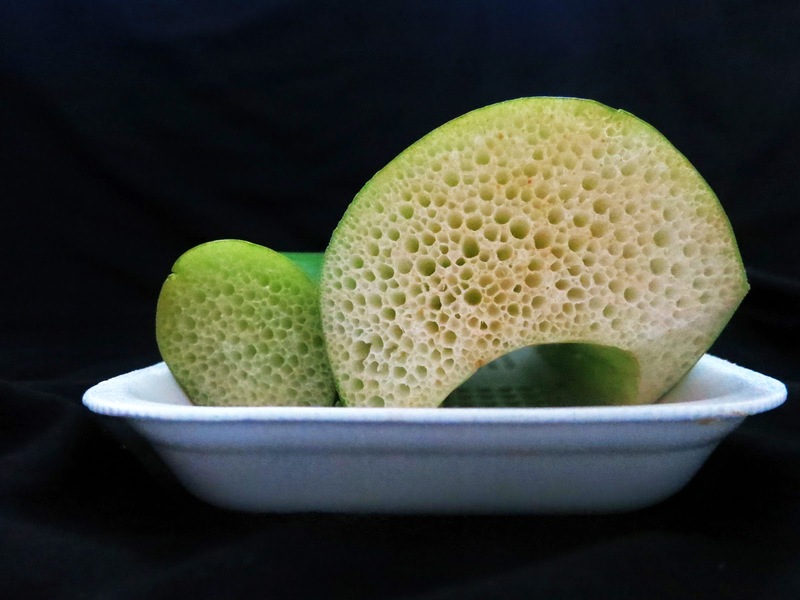 You can usually find these large, porous stems shrink-wrapped on a styrofoam tray in a pan-asian grocery near you. I was able to find these nice specimens at the Ranch 99 Market. Sometimes you can even find bac ha at Walmart. But don't buy it there! I've heard that the quality is bad, and that they may even be sourcing a related, but different, kind of plant and incorrectly labeling it. If any of this has piqued your interest, read on to learn more, including how to cook bạc hà, and recipe ideas (including one I made that was super tasty!). 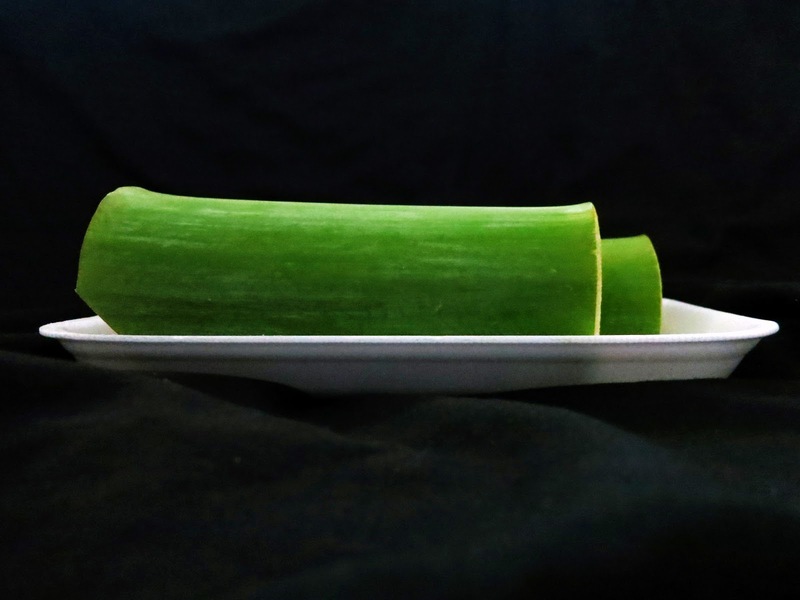 Bac ha is the fleshy stem of the elephant ear plant. The stems themselves can be quite large -- as thick as your forearm. Typically, they're smaller, though: wrist-thickness or smaller. The stems themselves are extremely lightweight, akin to styrofoam. This is because the stems are made of a sponge-like plant structure. It's truly unlike most other vegetables in this respect. Texture is bac ha's most prominent attribute; In terms of taste, it doesn't have much flavor. 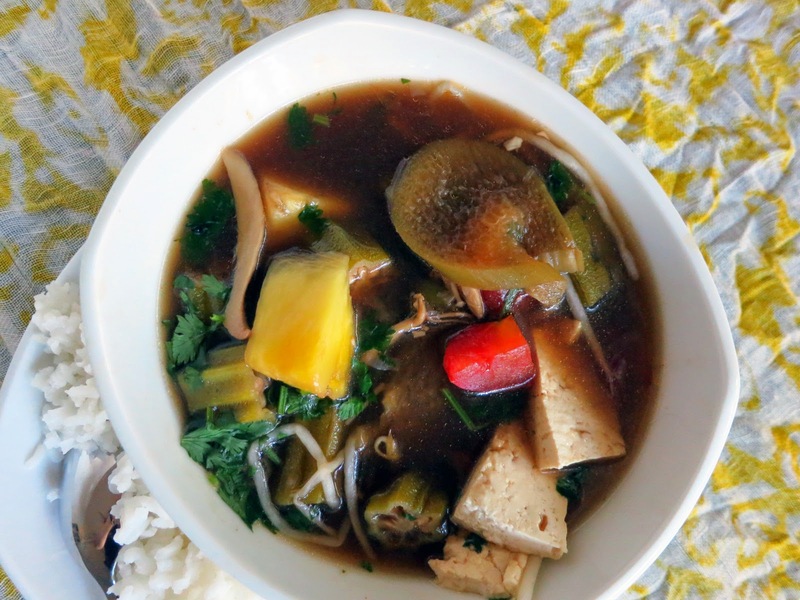 This spongey vegetable interior makes bac ha perfect for soups: the web-like structures trap broth. When you pull a piece of bac ha out of your soup and bite into it, it's full of delicious broth. It's similar to how delicious it is to dip bread into your soup. For this reason, a common use of bac ha is to make a sour vietnamese soup (known as cahn chua), or to add it to miso soup. You may have heard of the elephant ear plant before; it's known as the "taro plant" and some people eat taro root, and it is sometimes grown as an ornamental landscaping plant in their backyards. Don't just go out and try eating your landscaping, though! There are a wide variety of elephant ear plants that are cultivated for different purposes, from root development, to stem development, to landscaping use. Not all varieties are edible. Best to stick with what you find in stores. Choose bac ha that is firm, green, has no bruises or blemishes, and was recently packaged (check the date on the package). It is best if it's wrapped in plastic (to preserve moisture) and in a refrigerated/cooled produce area. Keep bac ha in the refrigerator for up to a week. Let's start with the important stuff: don't eat the stems raw. They contain calcium oxalate, which can cause skin irritation and itching *inside* your mouth and all down your throat, among other things. These compounds (luckily) break down with proper cooking. Peel the thin outer layer of green skin off of the vegetable. To do so, grab hold of a sliver of the skin at the end of the stalk, and pull. It should peel off easily. Slice the stalk or cut it into 1-inch cubes. Then, either boil for 5 minutes before adding it to your recipe OR massage salt into the pieces, squeezing moisture out of the taro stem until you're left with 1/3 of the original volume. Rinse and drain. Add to recipe and cook thoroughly. I'll let you know, though, that I left the green skin on, did not oil my hands or wear plastic gloves, sliced it up, and just was sure to boil it thoroughly in the soup recipe I made. No irritation occurred. So, be as risk-averse as you prefer. Miso Soup with Bac Ha: Use any basic miso soup recipe, and add peeled and sliced bac ha. Boil thoroughly. Below is a photo example of a recipe I made with with my bac ha: Vegetarian Sour Vietnamese Soup. To make the recipe, I used a traditional canh chua ca Sour Vietnamese Fish Soup recipe from Pham Fatale as a template, and also looked to the Wandering Chopsticks Shrimp and Fish canh chua recipes to make sure I was on the right track in terms of proportions, spices, and flavors. However, I made major modifications to convert it to a vegetarian/vegan recipe. I'll describe my modified recipe in a future post and will link to it from here! I can tell you now, though, that it was a tasty, exciting new soup that I haven't tried before and haven't seen on a menu before. I also sliced up some of the remaining bạc hà and added it to miso soup (not pictured). A tasty addition! If you're a bac ha fiend and see that I left out your favorite recipe, give me a shout! I'd love to know about more uses! Really good explanation! Thank you! And thank for the recipe!